There are select Apple Stores in the world that stand out from the rest and continue to draw a large amount of visitors every day through their doors. Whether for the Genius Bar, the free iTunes concerts, the history of the original sites, or the architectural allure of the new construction, each of these awesome Apple Stores has something unique to offer. 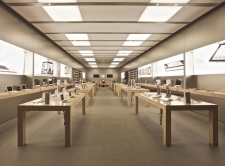 The largest Apple Store in the United States is on Boylston Street in Boston, Massachusetts. It is three stories high with a modern glass and stone exterior that is meant to match the ambiance of the surrounding neighborhood. The store also has a rooftop garden and is dedicated to environmentally friendly designs and features. These include the ability to harvest and filter rainwater, and minimize electrical usage by utilizing large windows and natural shading. This Hong Kong retail outlet was the first Apple Store to open its doors in the region, and is a flagship store that is situated in one of the most prominent shopping districts of the area. The IFC Mall itself is connected to other fantastic shops and high-profile business offices via a maze of elevated and connected walkways. The store incorporates the usual Apple Store architecture of glass walls and a spiral staircase which connects the 1st and 2nd floors. In a region plagued by rip-off Apple stores, this legitimate store in China was a major step forward in bringing authentic Apple products to the region. The Apple Regent Street Store in London combines several characteristics that make it one of the most popular stores in the world, including both its location and size. It is situated in an upscale shopping district in London commonly referred to as Regent Street, within a historical building from the Edwardian Period that once housed the Thomas Cook Travel Agency. Anyone looking to buy an iPad Air or Macbook Pro should definitely wait for their next trip to London so they have an excuse to visit this amazing Apple Store. In 2006 Apple unveiled a new flagship store in New York City that really lived up to their motto of the time: Think Different. The 32-foot tall cube made from glass sits in one of the most prominent districts of the most famous city of the world, a stones throw from Central Park and the iconic buildings of The Plaza and The Paris Theater. There are numerous reasons why this is one of the most popular Apple Stores in the world, and its envious location is definitely one of them. Departing from the traditional style that is the hallmark of many of their stores, Apple was adamant about staying true to the existing surroundings of Paris, France for its “Opera Store“. The name itself is an homage to the famous Paris Opera House that is situated directly across from it. In addition, designers were sure to incorporate many features of the bank that once occupied the building, as well as capturing the romantic setting of the nearby streets. The surrounding area is considered to be one of the most beautiful neighborhoods in Paris, which many visit simply to walk around the streets and soak up the history. Perched near the King Street Wharf in Sydney, the first official Apple Store in the southern hemisphere is concrete proof that Apple products truly are a global phenomenon. This flagship location on George Street displays the architectural details that are hallmarks of the other Apple stores around the world, such as the spiral glass staircase and huge Apple logo across the storefront. It is in one of the most popular areas of Australia’s largest city, and is nestled amongst premier shopping districts and tourist destinations. The store is truly a must-visit for anyone venturing down under. The Ginza location has the distinct honor of being the first Apple Store in the world to open outside of the United States. It stands five stories high, sporting a majestic metallic storefront and is located in one of the most popular shopping centers of Japan. The Sayegusa Honkan Building was originally built in 1965, however Apple completely renovated the space formerly occupied by Sumitomo Bank. While many of the features of the retail outlet resemble those of the other Apple stores, the Ginza store includes a pair of elevators that constantly run between the ground and 4th floors.